Innovation and entrepreneurship is subject to a fundamental paradox - the trade-off between creativity and focus. Many entrepreneurs are by nature creative individuals that must balance between glazing new ideas, products or features at the one hand, and execution and determinism at the other. 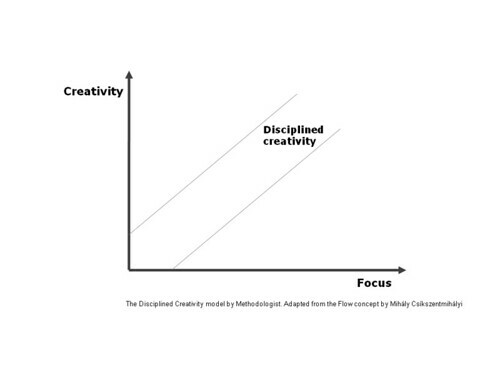 The Disciplined Creativity idea is derived from the Flow concept by Mihály Csíkszentmihályi to help innovators reconcile creativity and discipline in parallel. Update: In light of Lean Startup and Customer development methods this brings about a discussion on how entrepreneurs can stay true to their vision while still maintaining the flexibility to pivot. So I guess that that say creativity in a real sense could be for example ‘brainstorming’, but focusing or framing the promblem area that is brainstormed would give “disciplined” creativity. Hi Hugh. Basically I try to address to what extent one should allocate resources to new ideas (features, products, products) at the one hand, and to optimize/tune existing ideas at the other hand. That there is a trade-off.